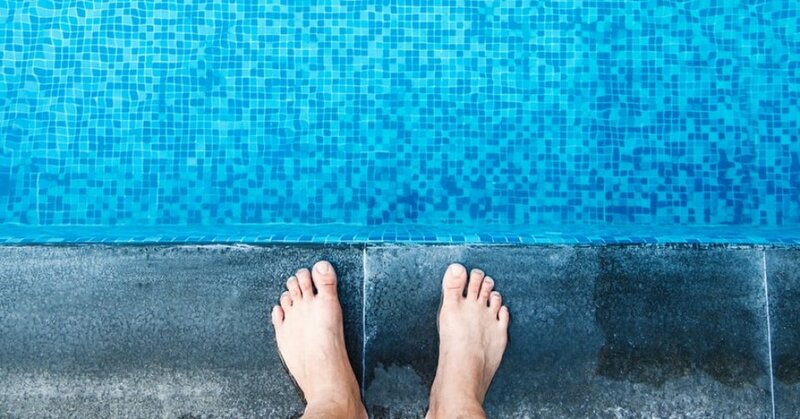 Your swimming pool probably isn’t the centre of your attention now that the weather has cooled down, but don’t forget about your pool just yet! Autumn and winter are the ideal times for making larger pool improvements that will make it easier to jump straight into the pool next season. You have the pool, now it’s time for the fun part – making it look good! The cooler weather brings with it the luxury of reduced installation and material costs for both landscaping and hardscaping. Whether you’re building a beautiful deck, paving around the pool or doing some major renovations, you’ll thank yourself for thinking ahead and starting in the off-season. Keep your pool cover clean – such a simple way to make your pool look fresh. Simply take the pool cover off the pool, brush it down with a soft haired broom to remove any debris and rinse with water. Clean out the shed – winter is the perfect time to organise your shed and discard all of the old pool chemicals you used last season. Declutter your pool area by rinsing the pool toys and storing them away for the rest of the winter season. So, what are you waiting for? It’s time to improve the look of your pool area! After a long pool season, it’s always worth checking the status of your water filters and pumps to ensure they’re up to standard. While it might be tempting to put it off until next season, it’s better to spend some time fixing or upgrading these systems while you aren’t using the pool. Making preparations now means that you get to jump straight into enjoying your pool next season! Better yet, you could make the most of your pool all year round by installing a heat pump. We recommend the Hayward Energyline Pro. Lastly, if you don’t own a pool yet and you’re tired of inevitable pool-envy that surfaces every time summer comes around – now is the perfect time to take the plunge and install the pool you’ve always wanted! The cooler weather provides the ideal conditions for installing a pool, namely cheaper rates and less demand, so that you can get the best bang for your buck with less waiting time. So, why wait for the weather to heat up? Beat the rush and plan your pool now so you’re ready for when the next season kicks off. And, if you do become a new pool owner, check out the great benefits you could receive through our new Pool Owner Program! For more helpful tips on how to improve your pool, visit our Facebook page!